For the first time an extensive examination of pastoral care to African American families has been compassionately and courageouly produced. Combining thorough social analysis, the stories of persons who have undergone severe abuse, and insightful theological reflection, James Poling and Toinette Eugene inform and challenge those who provide pastoral care to African Americans and individuals affested by violence and abuse. Balm for Gilead expands our understanding of the role of the Black Church as an agent of care and reconciliation for African American families experiencing the results of child and domestic abuse. Crossing the disciplinary boundaries of pastoral care, theology, and ethics, this book provides a major examination of core issues of family violence. The authors maintain that the contemporary Black Church must provide more extensive professional and ethical training and education for its pastoral care givers through a multisystems approach to effective forms of ministry for African American families. Using case studies from individuals who have experienced abuse or who struggle with the reality of domestic violence, Balm for Gilead identifies and explores theological and ethical themes that are crucial for understanding and revitalizing the pastoral care of African American families who suffer because of child and domestic abuse. Illuminating the dynamics of abuse in these families, and challenging the silence and helplessness surrounding their pain, this cross-cultural work will have a profound effect on all whose lives have been touched by this social and personal evil. 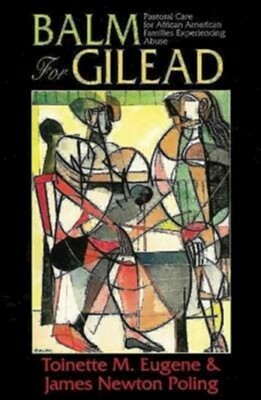 Balm for Gilead is indispensable for pastoral leaders whose ministry and profession is often the only hope of healing and reconciliation available or acceptable of African American families. I'm the author/artist and I want to review Balm For Gilead.